New planet discovered in trinary system – Another milestone in exoplanet research! | Pleasant's Personal Blog! New planet discovered in trinary system – Another milestone in exoplanet research! Though the number of extrasolar planets continued to grow over the years, exoplanet researchers were sceptical about existence of planets around multiple star systems since it was suspected that if the stars are not sufficiently farther apart, the constantly varying gravitational force would eventually tug the planet out of orbit. However, recent discoveries of planets in such star systems have proven this hypothesis otherwise. 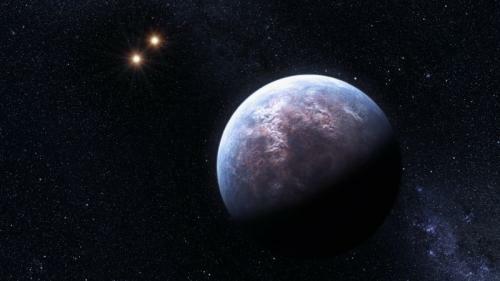 Planetary scientists last week announced the discovery of a new planet in the HD 132563 trinary star system in the constellation Auriga after a 10-year long study of the system which also made several other discoveries. 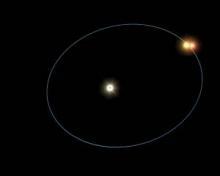 The system consists of two stars with masses equivalent to the mass of our sun orbiting around each other at 400 AU. The main star of the system called HD 132563A is itself a binary star making it a trinary star system. According to the team led by Silvano Desidera of the Astronomical Observatory in Padova, Italy, this fact was not previously known about the system which was initially considered to be a binary. This new planet orbits the secondary star in the system called HD 132563B and was discovered spectroscopically using the SARG (Spettrografo Alta Risoluzione Galileo) at Italian Telescopio Nazionale Galileo or TNG. It is estimated that the planet is at least 1.3 times the mass of Jupiter and orbits around its parent star at a mean distance of 2.6 AU with a moderately high eccentricity of 0.22. 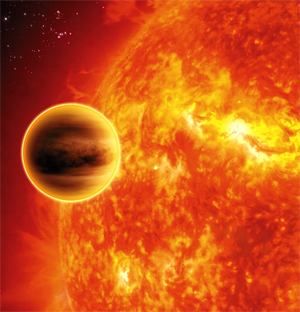 The team has tried to image the planet directly using adaptive optics since they could not initially rule out the detection as an instrument effect in the star’s glare. This discovery brings the total number of planets discovered in multiple star systems to eight. Though the number is small, it seems planets can be commonly found orbiting around more remote members of trinary star systems for good periods of time. The age of the H132563 system is estimated to be between 1-3 billion years in the shorter end and up to 5 billion years. The two estimates have been drawn by measuring the amount of stellar activity and lithium (which decreases with time) and fitting the mass and luminosity onto isochrones respectively. Either way, the planetary system is dynamically stable. The team has suggested that based on these eight discoveries, it is possible that the occurrence of planets on remote members of multiple star systems may be just as common as planets around wide binaries or even single stars. The Extrasolar Planets Encyclopaedia thus received its 565th member. The HARPS (High Accuracy Radial Velocity Planet Searcher), the spectrographic component of the European Southern Observatory’s 3.6 meter telescope in 2009 discovered a “Super-Earth” in orbit around Gliese 667C, the third star in multiple system located in the constellation Scorpius. This earthlike planet is 5.7 times the mass of Earth and revolves around its parent star, a red dwarf, every seven days. Written by: Pleasant on July 16, 2011.on June 22, 2014.